The Set Layout Names module is for managing the Layouts of the database. 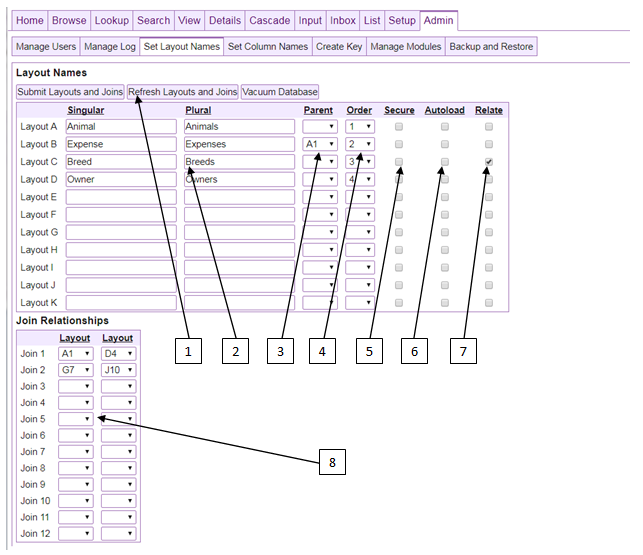 Layouts are like regular database tables and are sometimes referred to in Brimbox as psuedo-tables. Besides defining a layouts existence, the administrator can remove layouts, change layout names, define parent-child relationships, set the layout order, and define security level for the layout. The Set Layout Names module is only available to administrators and can be selected from the Set Layout Names button on the left of the Admin tab. The first buttton is for submitting the form setting the current layout to the values entered in the form. The next button will refresh the form to the values currently stored in the database. The final button will run the Postgres VACUUM DATABASE command used to clean up the database. This area is for entering the singular and plural layout names for layouts. To remove a layout definition blank out the singular and plural names and submit the form with the Submit Layouts button. This will remove the layout but not the underlying data. The underlying data will need to be cleaned up using the functionality on the Backup and Restore module. This is where parent-child relationships are set up, done by pointing a child layout at its parent. If a layout is top level or a single entity this entry should be blank. Layouts here are referred to by letter and number, A1, B2, C3….where row type 2 is equivalent to layout B. This is for setting the order in which layouts are displayed, and must be set ascending strictly from 1. This is for setting the security of a layout. A secure layout has a secure value of 1 unless custom security is set using a Global Array. The Autoload functionality is not yet implemented and is reserved. The related checkbox enables a layout to be used as a related table. A related table also needs to be set in the related columns of another layout (columns c41-c46). Join relationships are implemented here. Note that in the join table the lesser layout number has its value in the first column and the greater layout must be in the second column.